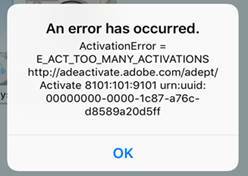 If you’ve received a message that you cannot activate your device because you’ve reached your limit of adobe device activations, you can either contact your library or use the form below to reset the activation for your device. Your device should be reset within 48 business hours of the request. Thank you. Your details have been passed on to your library.